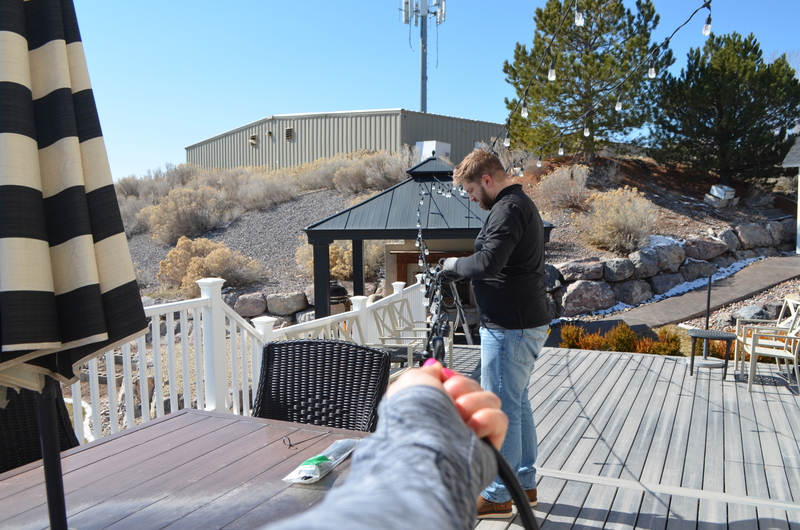 Spring is here, and there’s nothing I love more than prepping the backyard for the warm summer nights where we can grill every night, watch movies on the deck, lay under the stars and make s’mores together as a family. If you’ve been following us for a while, you’ve probably seen our gorgeous deck take shape, as we’ve been finishing projects for our dream backyard. It’s hands down, my absolute favorite thing about our house and it is my favorite place to style and host parties! We recently added a pergola and trellis (over the sliding glass door) and it’s now complete with, are you ready for this? Yes friends, I have found the coolest and most durable acrylic Edison-style bulbs that won’t break if dropped, stepped on, or blown around in the wind. They are called Enbrighten Seasons Color Changing Lights, and I found them on Amazon. For this transformation, we used two types of lights: Cafe Lights & Mini Landscape Lights. The Cafe Lights were hung overhead while the Landscape Lights were placed in a box planter and in the top slats of the decking. I actually asked Nick to add them to the planter while I put the baby to bed, and when I came back downstairs, he added them to the planter and the deck flooring which I hadn’t even considered. I was so impressed by the out-of-the-box creativity of how he added them to the deck. Don’t you just love when that happens? Who doesn’t love a good B & A transformation!? The trellis made for the perfect way for the lights to hang overhead, as they connected to the pergola. Bonus points to my hubby for his mad math skills, so they all lined up just right! For our backyard setup, our pergola is about 40ft from the trellis and we used 2 – 48ft strands and 1 – 24ft strand, to give you a reference. I love the versatility of these lights, I can go from a warm traditional cafe light and with a push of a button change it into a fading rainbow color scheme that makes me want to immediately host a mad hatter inspired tea party out there! 1. They are remote controlled (wirelessly) and you can choose from over 120 color possibilities. They are totally customizable with timers and dimming to use to match whichever mood, holiday or party theme you can dream up! 2. The lights all sync up and it feels like a party once you start playing with the settings and colors! Which is great for me because I love being the party house, and NOTHING says party like having those little elements of magic (or in this case color-changing lights!) that make the party details extra special. 3. Pairable remote- pair included remote to control both Cafe Lights and Landscape Lights with one remote. These lights were also very easy to hang up and took just over an hour and a half from start to finish. Making this an easy Saturday project that you hang up and could enjoy dancing under that same night! And I also love that the “white” comes in three different color options, warm, neutral and cool. Traditional Edison-bulbs are almost always warm yellow, so it’s way nice to have the options! So there you have it! You can bet I’ll be out on my deck every night this spring and summer making sure my yard is ready for whatever holiday, team sporting event, or party with multi-colored lights to match! Head over to Amazon to grab some lights for your yard!